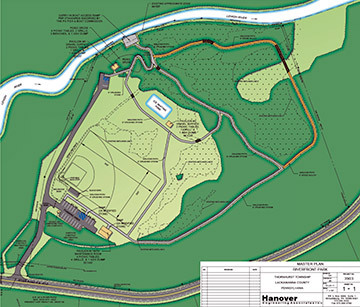 Hanover Engineering developed a Master Site Plan for Thornhurst Township’s Riverfront Park site along the upper Lehigh River, a project funded by a Growing Greener Program grant through the Pennsylvania Department of Conservation and Natural Resources. The park site contained special attributes which were highly desirable to open for public use, including public access for trout fishing and carry-in watercraft; boreal wetlands and vernal ponds; and picturesque natural areas along the upper Lehigh River. Wetlands and waterways were accurately delineated and then survey located for inclusion on the base plan drawing. The property boundary was also surveyed, along with detailed topography of the area proposed for active recreational facilities. Trails were laid out to highlight interesting and unique environmental aspects of the site, as well as to provide the most appropriate access to the Lehigh River and to maximize potential for handicap users. Planning for the park facilities was determined through a variety of public input processes, including public meetings, key person interviews, a site walk, and general information submitted for consideration by township residents. The final plan included a multi-use athletic field, three pavilions, an ice-skating rink, carry-in boat access area, fishing access, streamside picnic grove, gravel trails, woodchip trails, boardwalk trail sections, and environmental education components. Adequate parking at two locations was designed, along with proper stormwater management and composting restrooms.